← What is Waiting in the Wings? This picture was taken in September 1979. There is a print of it in my office, faded a bit. When I wax geological, the sheer improbability of this mineralogically unusual salient weighs heavily. High in Magnesium, Potassium and Sodium; low in silica. Indicative of deep mantle provenance and deep crystallization. It is not alone. It is the oldest and largest of a late Oligocene/early Miocene Navajo Intrusive Complex. 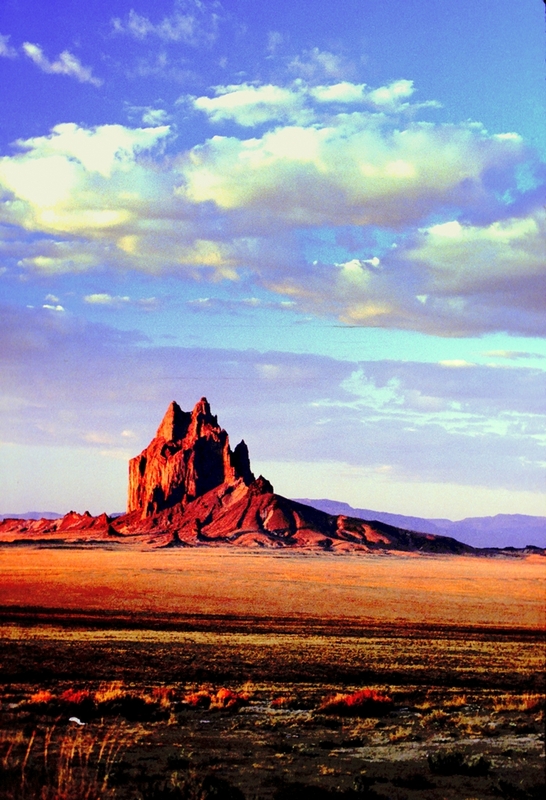 When you drive to Kayenta, Arizona, you see the foreshadowing, mafic menhirs begin punctuating a red landscape . We were young then. We had climbed the highest peaks in the major ranges of Colorado and were headed for a river trip down the Grand Canyon. Foolish perhaps, we steered our VW bus down a dirt road in the dark. Knowing full well it was Navajo land. Knowing full well the site was sacred and climbing had been banned. We hadn’t come to climb. We came to worship. Maybe that spirit was somehow clear to a few pickup trucks that slowed to check us out. Whatever, they let us be, and I took this picture as the first sun washed it in the morning. Unforgettable, at least with a reminder on the wall, and business and fate carried us back there last week. 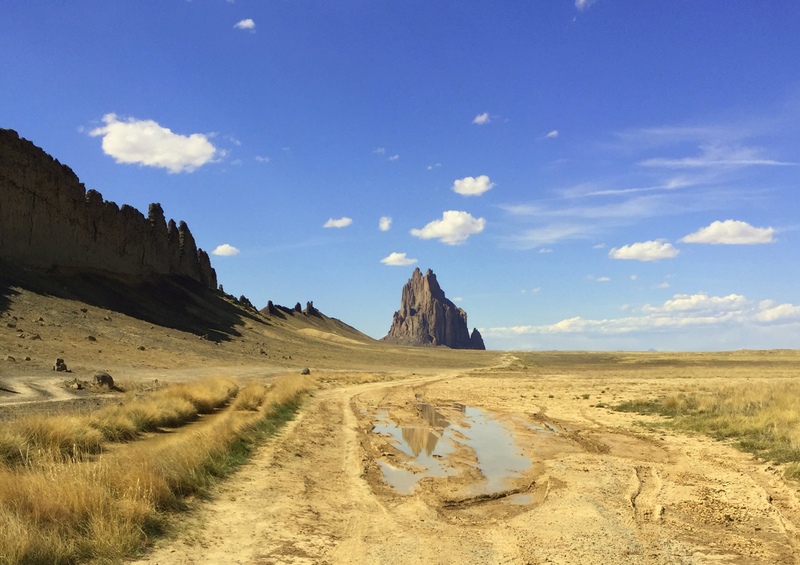 From the south the shoulders of scree are less prominent and you get a perspective on one of the three dikes that radiate from Shiprock in nearly 120 degree increments. The real story here may be the uplift of the Colorado Plateau. Like at the rim of the Grand Canyon, your feet are in the Triassic, and to see when the dinosaurs roamed you look not down, but up. You try to imagine a Mesozoic section as tall as from the rim to the river that has been eroded away. 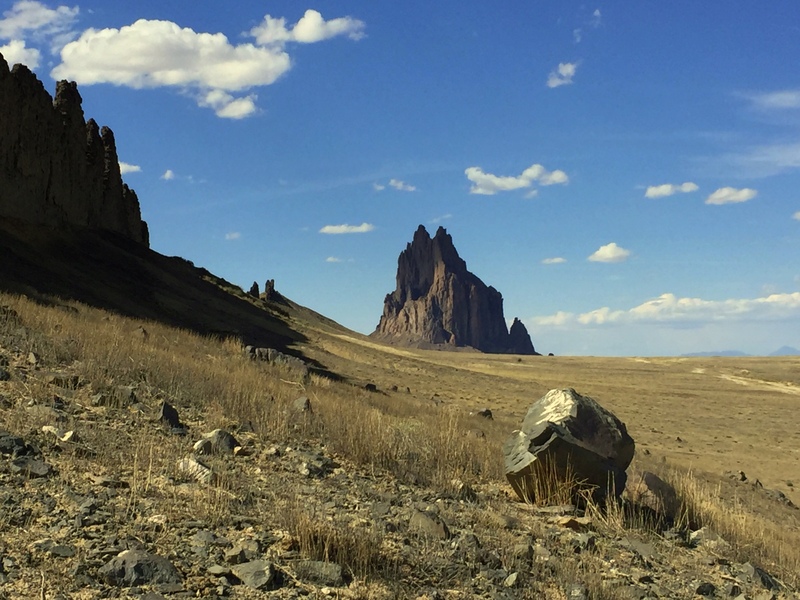 This is the story of Shiprock. It’s ultramafic low silica magma intruded a mile of sediments since removed. Why this uplift and under plating should have happened here, at a time between the Eocene Laramide buckling of the “ancestral” Rocky Mountains, and the general uplift and extension of the intermountain West since the Miocene, remains a mystery. So much so that Navajo legends of an uplifting creature saving their ancestors is still nearly as good an explanation as any. 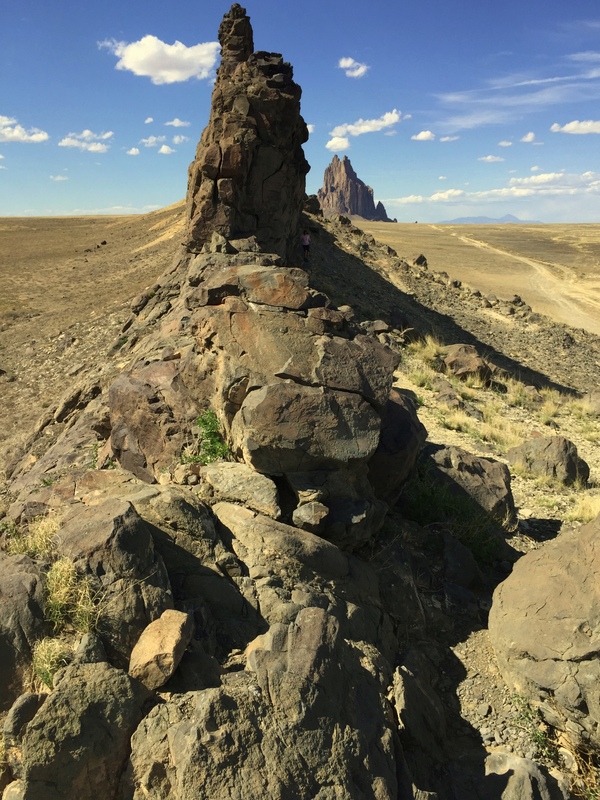 This entry was posted in Geological Evolution of the Western United States, Geology and tagged Shiprock. Bookmark the permalink.